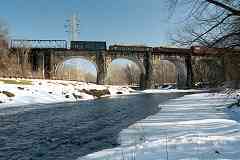 This small, circa 1830 arched bridge is almost lost in the shadow of I-195 (seen in the background), but does have a claim to fame: it is the oldest original railroad bridge still in mainline use anywhere in the world (!). When CSX recently made signal and track adjustments here, they opted for concrete ties rather than the usual wood. 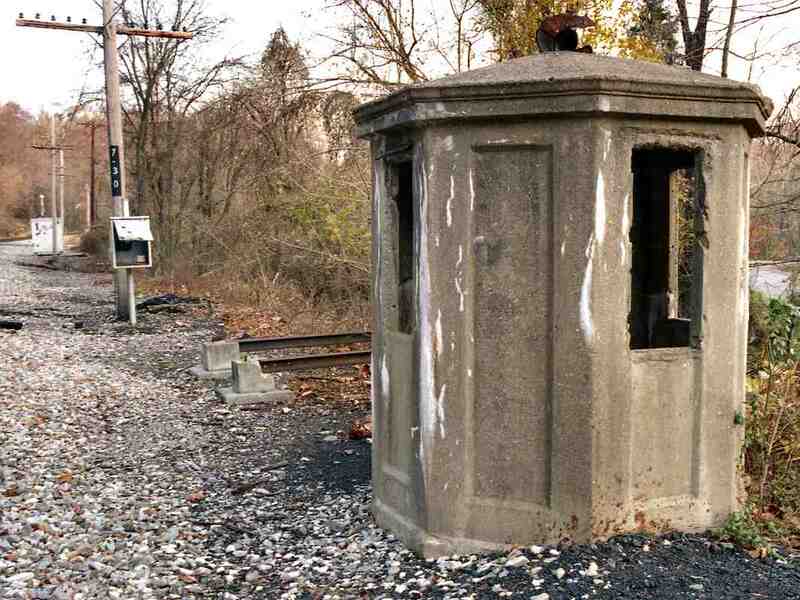 It is unclear if this is a test site, or if CSX has already chosen to switch to concrete as ties need replacing. With concrete, track base design has come almost full circle in 200 years. 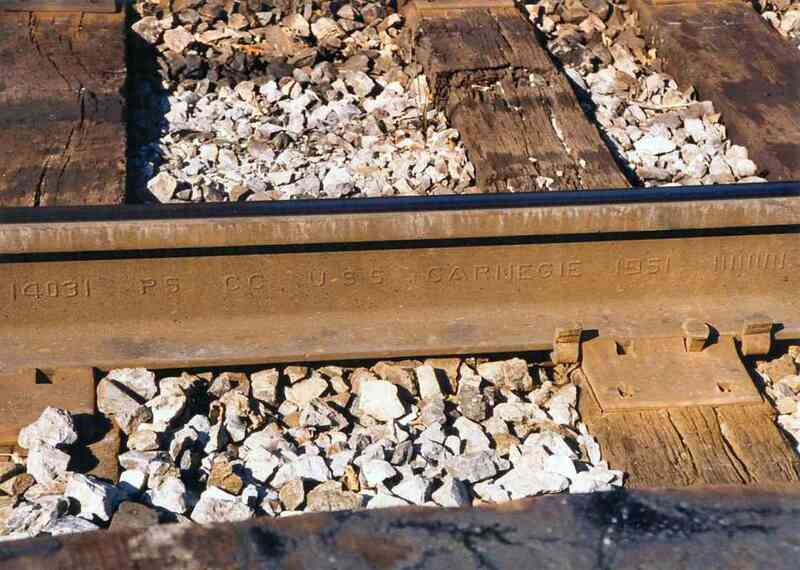 In 1830 the B&O's original track base here was hard, permanent granite. This view looks back from the St. Denis station, a very quiet commuter stop. There is parking room for about 20 commuters, and even that is rarely consumed. In the foreground is the I-195 overpass, and beyond that is Washington Blvd. 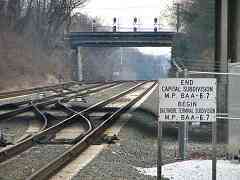 (US Route 1), and even farther in the distance are signals at Halethorpe, about a mile back. St. Denis makes an easy place for train watching as all the traffic from both the OML (leftmost track) and Capital subdivisions passes through. Photos can be a bit tougher: the sunlight never seems to be at a very good angle when I visit. 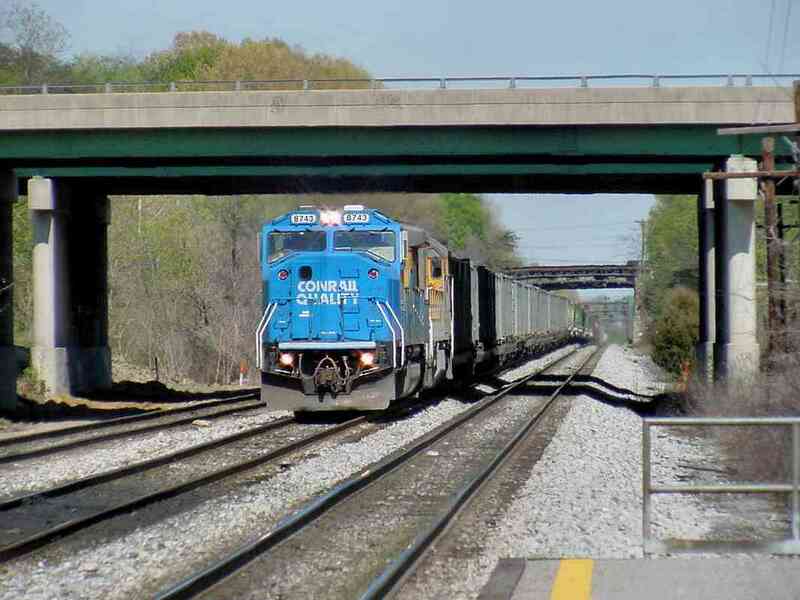 Some of the local railfans that frequent this location are apparently experienced railroaders and some have said they are not the most welcoming to newbies. I've never met them, so cannot personally comment. If somehow the traffic gets slow at St. Denis, you can always read the rail manufacturing IDs. This segment was made back in September 1951 at US Steel's Carnegie plant. St. Denis is also a staging location for trains as they approach Baltimore. Trains frequently pause here for a few minutes and conveniently pose for photo ops. 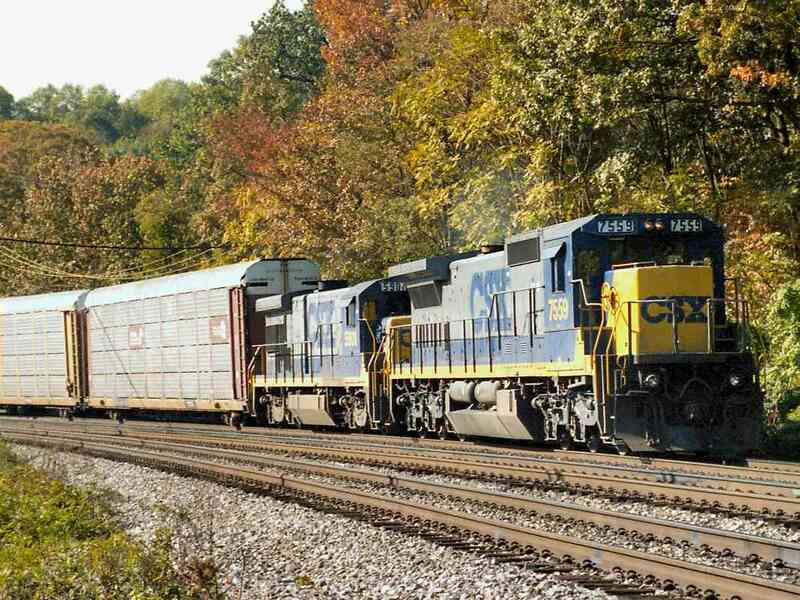 On this day CSX 8092 and HLCX 6070 (a leased unit) idle and await instructions with their short mixed freight in tow. That's the Rolling Road overpass in the background. St. Denis was named not for a saint, but rather Denis A. Smith, a landowner in this area who was involved in the collapse of the Bank of the United States. That he managed to long evade personal liability for his irregular banking he was given the moniker "Saint Denis". 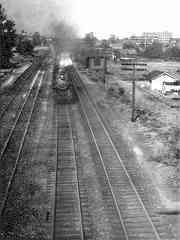 As viewed from the Rolling Road overpass during the age of steam, four tracks passed through St. Denis. That's the B&O's passenger station at the center, and the Calvert Distillery plant at distant right. Now St. Denis station is the small booth just beyond the nose of the lead locomotive. Since both the OML and the Capital Subdivisions pass through here, there's plenty of traffic to watch, and the viewing is easy. The former Calvert Distillery is now a Road Way Express trucking facility. 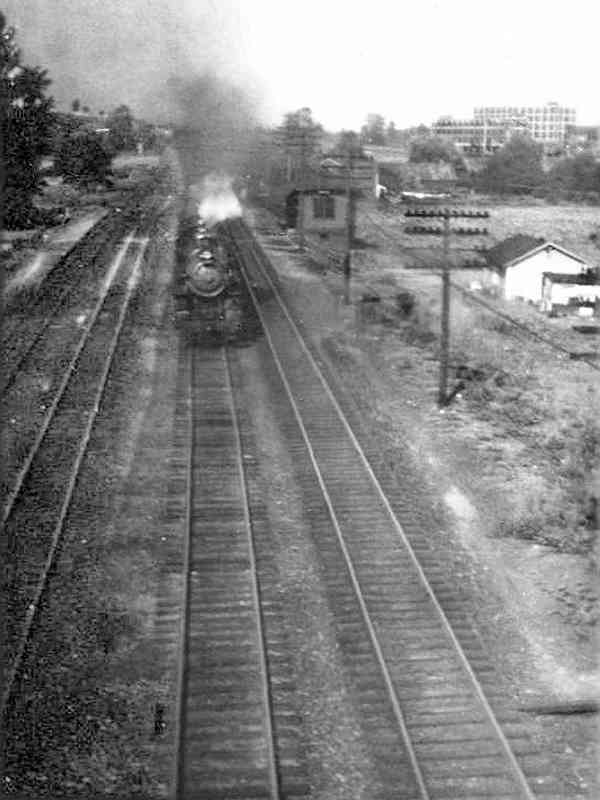 This is the view west from the Rolling Road overpass, which was built by the state in 1930 to replace the grade crossing that had been here. 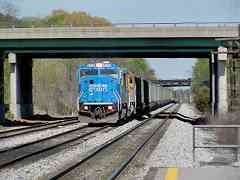 CSX 724, CR 4437 and CR 2781 are about to pass under the bridge as they lead a mile-long mixed freight eastbound. Rolling Road got its name from the practice of 18th and 19th century farmers who rolled large bales of tobacco from their Baltimore county fields down to the port of Elkridge, the limit of navigation on the Patapsco River. It's a bit awkward to find, but Sutton Avenue between St. Denis and Relay is another great spot for train watching. 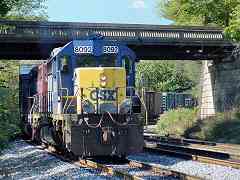 You can drive to the location from which this photo of CSX 7559 and CSX 5901 was taken. Note both engines of this pair are facing the same direction, a less-common arrangement. The town of Relay predates the railroad. At Relay, fresh carriage horses would be added for the trip between Baltimore and Washington. 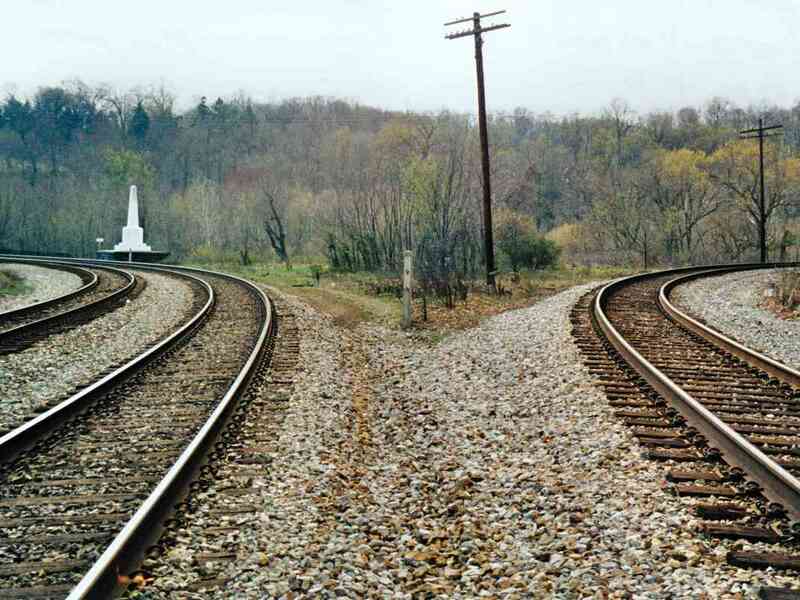 It only seems appropriate that the railroad chose Relay as its location to split the OML and Washington Branch. 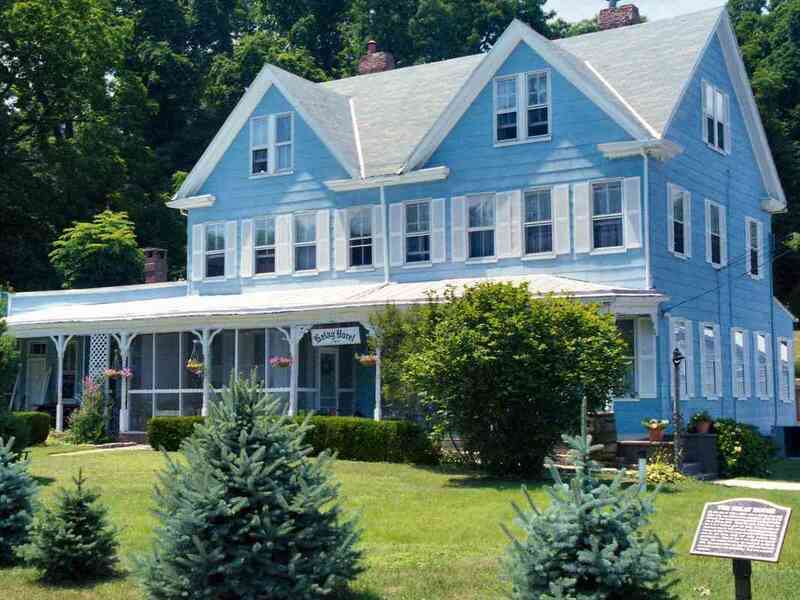 The Relay House served passengers who rode up from Washington, and paused before heading to points west via the OML. The original Relay House burned down in the late 1800s and was rebuilt in the form shown here. 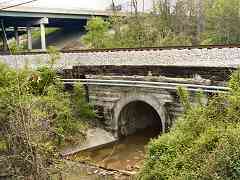 In 1873, the B&O constructed its Viaduct Hotel a short distance down the track from here. 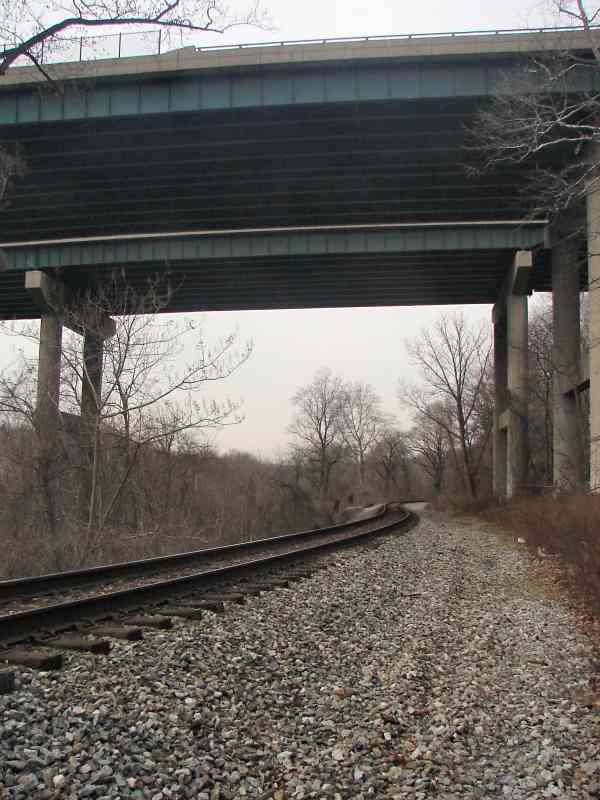 To find your way to Relay and the Thomas Viaduct (shown below) turn onto South St, which is a small road just south of the I-195, US Rt 1 intersection. (South St is marked with signs to "State Park".) Once on South St, avoid entering the state park. Instead, follow South St as it curves and turns into Rolling Rd. Rolling Rd proceeds uphill over a bridge that crosses the tracks, and leads you to a T-intersection. Rolling Rd continues right from the T, but you want to turn left onto Railroad Av. 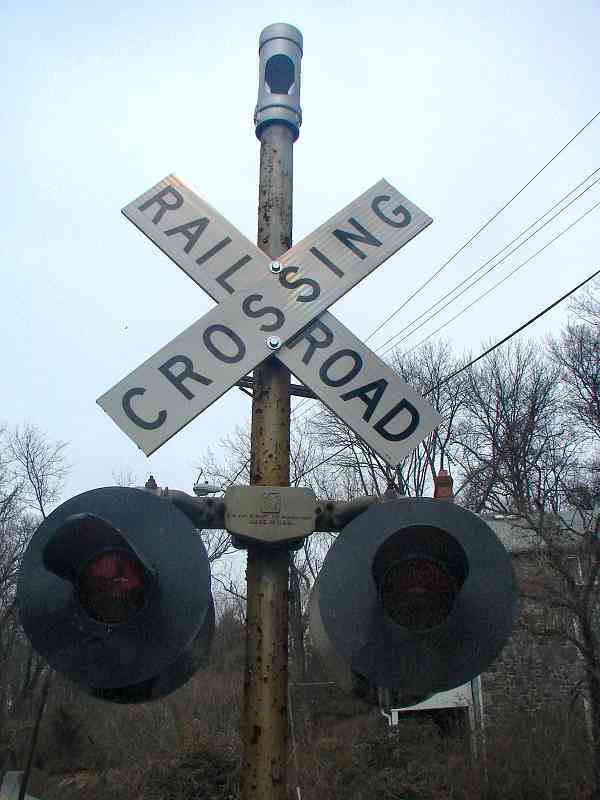 Follow Railroad Av downhill to where it parallels the tracks for a short distance, then park. 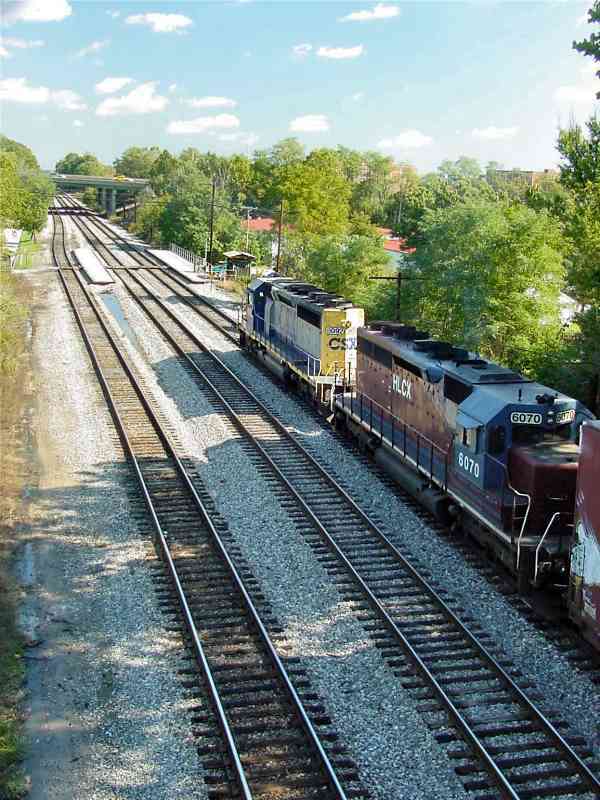 Note: all three tracks here are in active use, so watch very carefully for trains! Here at Relay the tracks split. 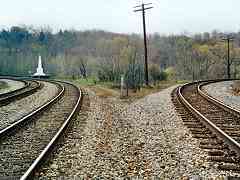 On the left, the Capital Subdivision heads for the Thomas Viaduct (marked by the white monument) and on the right, the OML bends around a rock cliff. B&Os Viaduct Hotel was located here between the two routes. 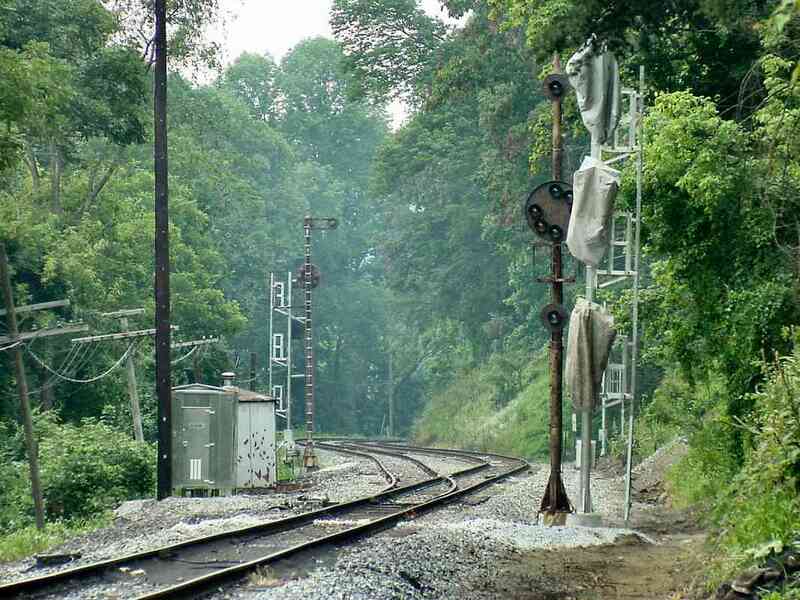 Just beyond the white marker, and the bend in the OML track, the ground drops to the Patapsco River. Compare this photo with that taken in the 1860's shown on page 105 in Impossible Challenge II. The view is almost identical, and it's interesting to see how the site has, and has not, changed. 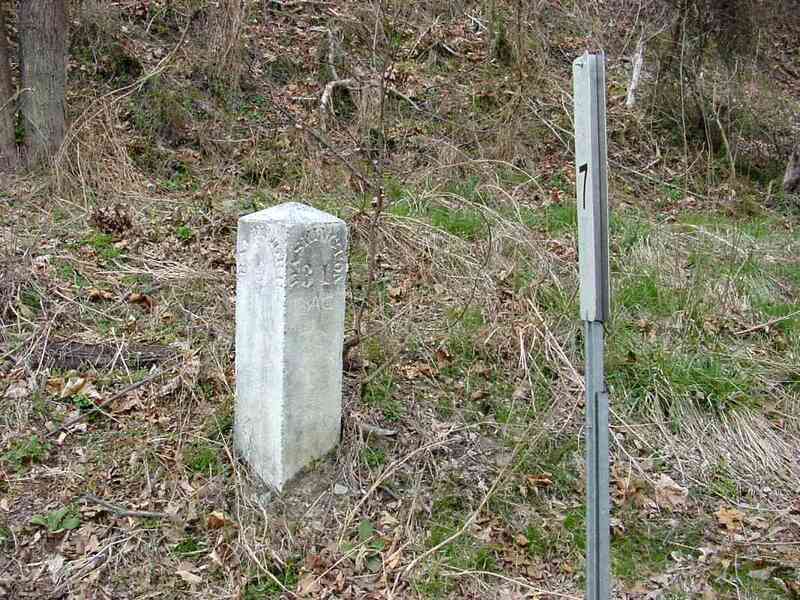 An attractive stone mile marker had graced this location, but there's something unusual. Actually, there are many things unusual. 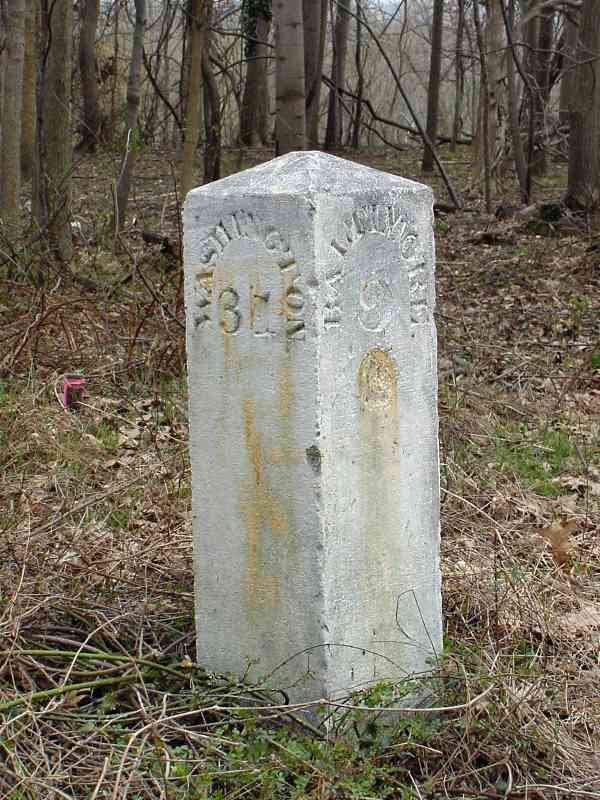 This was the only known stone marker along the OML, but in reality it is marking the distance along the Washington Branch. The old stone says 9 miles to Baltimore, but the new sign says 7 (it's too far west by about 1000 feet). When the stone was placed, the Camden Cutoff did not yet exist, so the route had been 2 miles longer. 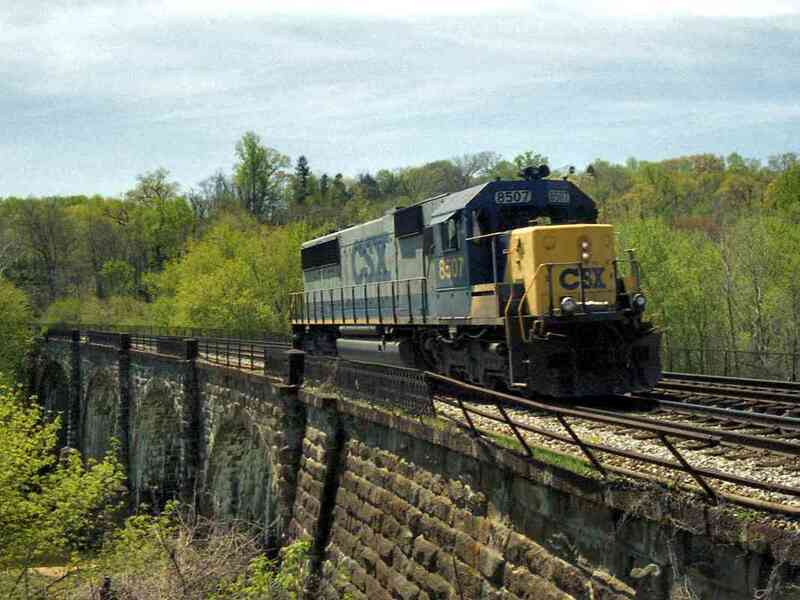 CSX still employs the old mile counting method along its present day main line, the former Washington Branch. The result: there now exists no "mile 8" on the main line. 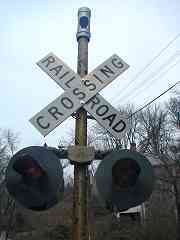 The picture captioned "Relay" above shows main line mile marker 9 which sits less than 100 feet away from this marker. A remote possibility is this stone was moved here from a location nearer DC when Metro Green Line construction threatened its original home. This was the only known stone marker on the northwest side of the tracks. All the others are currently on the southeast side. 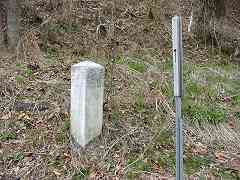 This was the only known stone marker with a sibling on the other side of the tracks. Like a competitive sibling not wanting to be outdone, this marker also has something unusual: it is the only one known with reversed engravings: Washington on the left, Baltimore on the right. This order of the engravings makes sense to me. While aboard a circa 1835 Grasshopper-powered train steaming along at a then-brisk 10 mph, forward-facing passengers to Washington (left to right in this photo) could read the left side of the marker and know how far their destination remained. Yet, all the other extant stone markers from here to Washington display the city names in other order: Baltimore on left, Washington on right! The B&O of that era was too detail-oriented for the engravings to have been a mistake. I suspect the surviving mile stones on the way to Washington were at some later date moved from one side of the tracks to the other. Speaking of moving, in January 2007 CSX excavated and removed these markers... the (unconfirmed) rumor is they became gifts to an executive. I suppose these items are CSX property, and therefore CSX can do with them as they wish, but I'd rather this unique and historic pair had been donated to the B&O Museum. 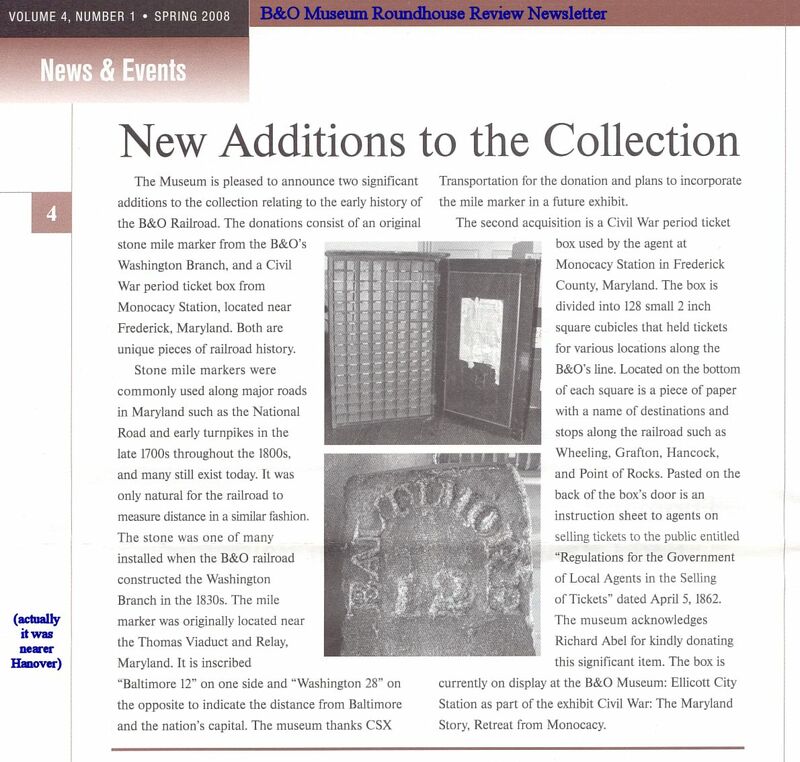 In February 2008 I was pleased to hear from B&O Museum Director Courtney Wilson that indeed CSX did remove and donate another of these markers to the Museum. 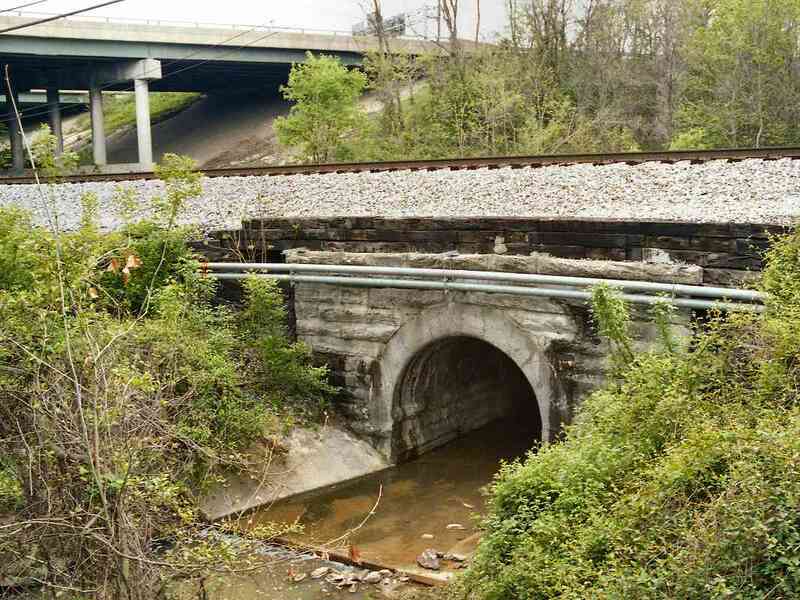 The OML does not cross the Thomas Viaduct (CSX's Capital Subdivision now does), but this venerable structure is too significant to skip without mention. This photo captures only the northern half of the bridge. 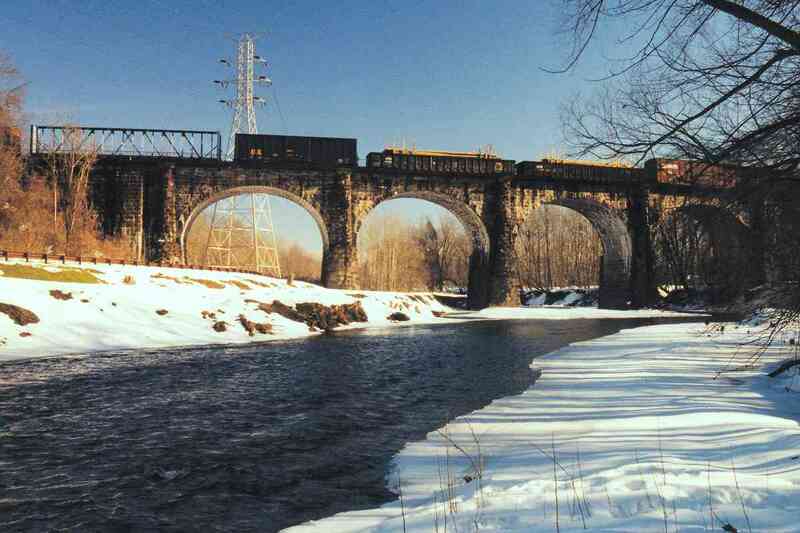 At approximately 700 feet in length, the Thomas Viaduct was the longest bridge in the USA, and second longest in the world (London Bridge is slightly longer) when it opened in 1835. Sections of the ornate iron railing installed over the objection of Benjamin Latrobe, the bridge's architect, survive on the SE side (left). 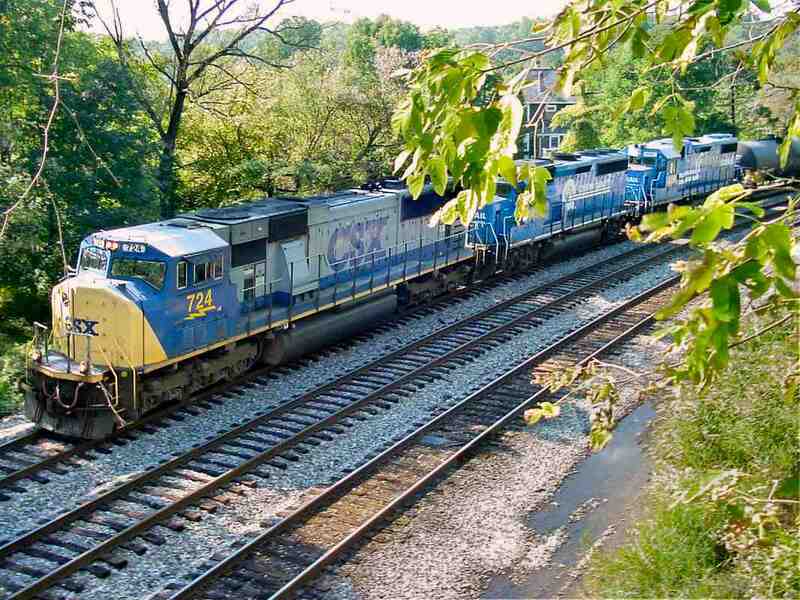 Here we see lonely CSX 8507 traversing on a spring day. Easy access makes this classic structure a must see. Tangent: This was the first operating locomotive I photoed on what was the B&O's Washington Branch. Ten years later, it remains the only engine I've ever seen operating solo in the region. 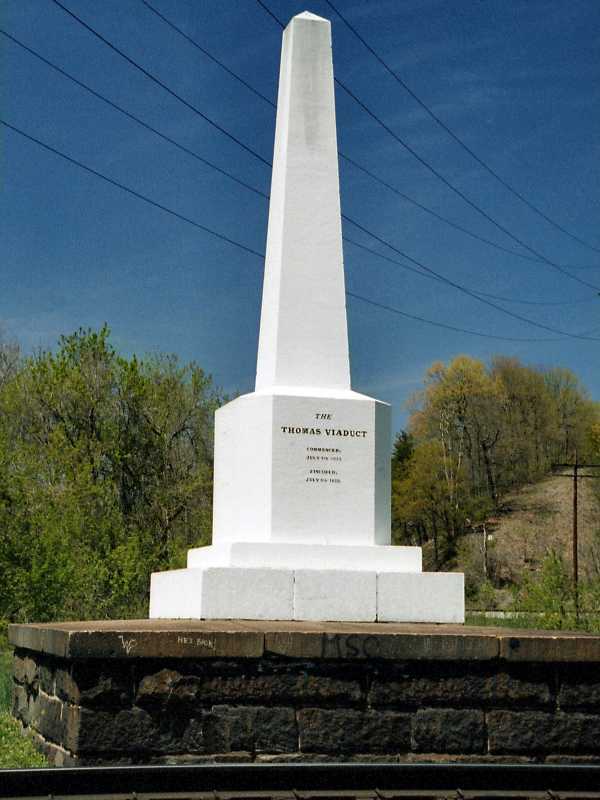 This obelisk pays tribute to the men who dreamed, engineered and built the Thomas Viaduct. 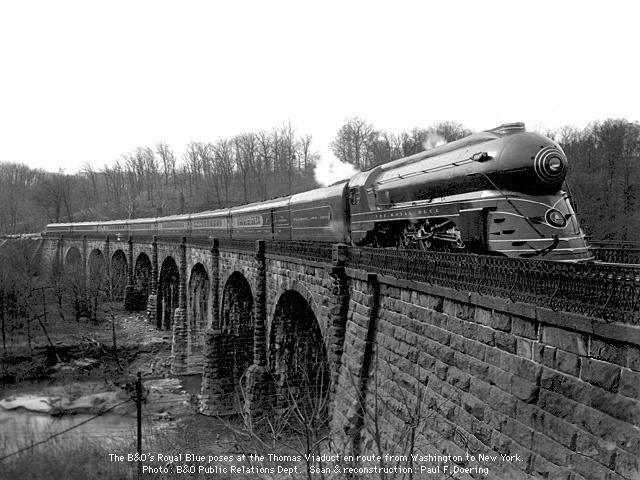 The great stone structures of the B&O were not easy to construct, but they have paid dividends by virtue of their reliability and longevity. The tracks and utility poles at distant right belong to the Old Main Line. 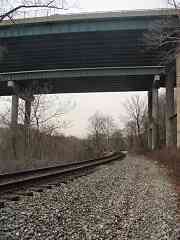 This is the view of the Thomas Viaduct from the Howard County side of the Patapsco River. Shortly before I captured this photo, deer had been drinking at the river, and left the footprints seen in the foreground snow. To get to the location of this shot, from US 1 turn onto Levering Avenue, pass under I-895 and the viaduct, and continue for a short distance along the park road that parallels the river. Back on the OML, heading away from the Viaduct a single track curves under Interstate 95... such curves are common, perhaps too-common, as the OML follows the bends of the Patapsco River. Unlike the interstate, the B&O was funded largely by private money. Since private investors incur high personal risk, they tend to carefully study where the odds of long-term investment returns are best. 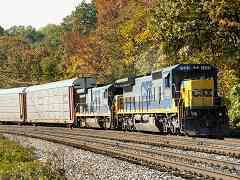 This route would not have been selected for the first "rail road" had it not held great promise. With such high potential, perhaps it should not surprise us that even some 200 years later a railroad can still be operated profitably here. The 19th Century (distance) is framed in contrast by the 20th as the Patapsco Park's access road curves below. If you visit, beware the noise from auto traffic on I-95 can drown out the sound of an approaching train. Use extreme caution! 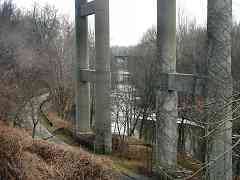 Unseen on the left, the Old Main Line parallels the river. The community of Avalon takes its name from the Avalon Nail and Iron works which had been a major business at this location. Lured by the power of falling water, many manufacturing industries were attracted to the Patapsco River valley. These industries were customers of the B&O, and one of the reasons the railroad chose this route. Unfortunately, a terrible flood in 1868 either destroyed or damaged much of the valley (as well as miles of the railroad). The B&O recovered and rebuilt, but most of the businesses did not. Since then, nature has reclaimed the areas previously occupied by factories, and only relics remain. Later floods and the availability of other power sources encouraged businesses to locate elsewhere, and most of the land is now part of Patapsco State Park. 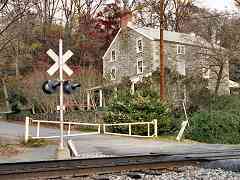 The grade crossing shown here (Gun Road) is now permanently closed in order to prevent "back door" access to the state park. Historical account attribute Gun Road to George Washington. This crossbuck post is topped with an unusual item, one not present in a 2002 photo. Any ideas? Warning sound maker? Air quality tester? Hidden camera? "The device at the top of the pole is an electric bell. It produces an audible, digital version of a bell ringing. 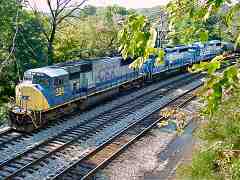 Some newer locomotives have the same thing." Looking west from Gun Road through summer haze lets us glimpse the eastern endpoint of the 9621 foot-long Avalon Siding. Cloth bags make new signals look like ghosts, but soon it will be the round CPL (color position light) signals that are the ghosts. This Avalon supplied the name for the Avalon Hill Game Company established by Charles S. Roberts who had lived nearby. Roberts was the great-great nephew of Charles Swann Roberts, president of the B&O from 1848 to 1853. AH published several railroad-themed board games, including B&O/C&O, and Rail Baron® which inspired this photo tour. This concrete structure was a B&O telephone shack. Before the days of on-board radio, crews would pause here and call ahead for instructions. 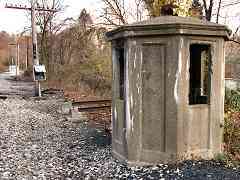 This is the only surviving octagonal shack on the OML, and one of only three in the Baltimore area, one of which is at the B&O Museum. During non-leaf season, it can be seen from the park service road that parallels the south side of the tracks here just west of Gun Road.